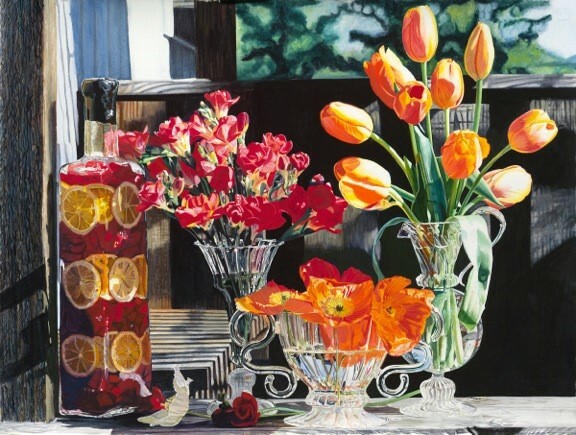 Coos Art Museum welcomes award-winning artist Sharon Wise for an intensive 3-day “Realism in Watercolor” Workshop Monday, Tuesday and Wednesday, March 9, 10 and 11, 2015 from 10:00 a.m. to 3:00 p.m. A master at capturing light, Sharon will share how to convey reflected and refracted colors and highlights as seen mirrored by a silver pot, through a crystal vase or as it travels through flower petals. By pushing the limits of the dry brush technique in transparent watercolor the many layers of paint through color and shadows are revealed, producing the effect of an oil painting on canvas. Workshop participants will cultivate the same unparalleled skills in creating their own representational paintings. Sharon Wise is a 2014 CAM Biennial Honorable Mention recipient for her exquisitely detailed watercolor painting Eagles Nest and the First Place Winner of the 2012 CAM Biennial People’s Choice Award, for which she received a solo exhibition at Coos Art Museum. Fee for the 3-day, adults only workshop is $175 for CAM members, $190 for non-members. Participants should be familiar with painting using watercolor and be of intermediate to advanced skill level. Class size is restricted to 6 participants minimum, 12 maximum. Registration ends February 28, 2015. For online registration use the booking form below or contact the Art Education Dept. at (541) 267-3901.